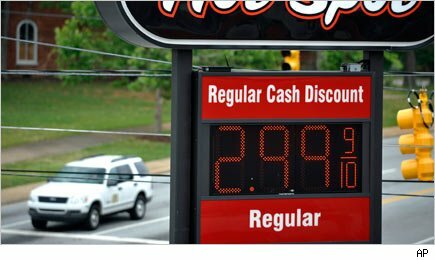 Oil prices hovered around 8-month lows near $80 a barrel Thursday after the U.S. central bank balked at implementing vigorous stimulus measures to boost waning economic growth and U.S. crude stockpiles rose unexpectedly.By early afternoon in Europe, benchmark oil for August delivery was down 92 cents to $80.53 a barrel in electronic trading on the New York Mercantile Exchange.Earlier in the session, the contract dropped to $79.92, the lowest since October. On Wednesday, it fell $2.90 to settle at $81.45. In London, Brent crude for August delivery was down $1.13 at $91.56 per barrel on the ICE Futures exchange. The Federal Reserve on Wednesday extended an interest-rate reduction program known as Operation Twist, pledging to sell $267 billion of short-term Treasury bonds and buy longer-term Treasurys through December. However, traders had been hoping for a more aggressive stimulus package known as quantitative easing. “Bears are on the cusp of smashing through the $80 level,” energy trader and consultant The Schork Group said in a report. Schork said the benchmark U.S. crude could fall to $74 and Brent to $82. A surprising jump in U.S. crude supplies also weighed on crude prices. The Energy Information Administration said oil supplies grew by 2.9 million barrels last week while analysts surveyed by Platts, the energy information arm of McGraw-Hill Cos., had predicted a decrease of 600,000 barrels. Crude has plunged about 25 percent from $106 early last month amid signs of slowing economic growth in the U.S., Europe and China. However, some analysts say investors are too pessimistic about global crude demand prospects. “Oil prices at current levels are too low and a more a reflection of risk aversion rather than any significant unwinding in demand,” National Australia Bank said in a report. In other energy trading, heating oil was down 0.71 cent at $2.5775 per gallon while gasoline futures fell 2.59 cents at $2.4814 per gallon. Natural gas gained 5.1 cents at $2.568 per 1,000 cubic feet. Quality Homes Deserve Quality Heat! Builders and realtors alike are well-advised to consider the many advantages of Oilheat. Advantages that add value to homes and make them easier and more profitable to sell. Most importantly, Oilheat increases buyers’ immediate and long-term satisfaction with their homes—thereby enhancing your reputation as a quality builder or realtor. Research conducted at Brookhaven National Labs shows that Oilheat advances havereduced oil burner emissions to near zero levels. The new U.S. Environmental Protection Agency emission ratings affirm that oil burners are now one of the cleanest combustion sources in the United States. One of the main things buyers want in a home—whether new or pre-owned—is comfort. (If you can’t be comfortable in your own home, where can you be?) That’s why the choice of heating fuel used in a home is so important. Oilheat is a smart choice. It keeps families snug, cozy and comfortable throughout the entire heating season—and supplies plenty of hot water as well. The cost of heat is also very important to homebuyers. Today’s Oilheat appliances offer energy efficiencies 83% to 94%. That means from 83 to 94 cents of every dollar spent on fuel goes to heating the house and the hot water used in it. This outstanding efficiency does wonders for the family budget! With Oilheat, homeowners have a secure supply of fuel right on their own property. When additional fuel is needed, it is readily supplied by dependable local oil dealers. With over 36 oil-producing countries, the U.S. is not dependent on any one region—and totalproven reserves are about 60% higher than they were in 1985. All this makes oil the dependable heating fuel of choice. Homeowners will appreciate Oilheat’s safety for a variety of reasons. Home heating oil will NOT explode and is not even combustible at room temperature. It has to be heated to 140°F. before it vaporizes. In addition, an Oilheat system will give off smoke and turn itself off before emitting dangerous carbon monoxide. And having an oil tank allows homeowners to have their own supply safely stored on their property. Today’s homeowners are aware of the importance of environmental protection. That’s another reason why they like Oilheat. Air polluting emissions from Oilheat are insignificant, and oil storage tanks offer no threat to the environment. Fuel oil is biodegradable. Oilheat is not only best for homeowners—it’s best for our planet as well. Oilheat is versatile—it can be used in forced air, boilers or radiant appliances. Air conditioners, air cleaners and humidification systems can be added, radiant tubing can keep driveways and walkways free of ice and snow. Great for pools and hot tubs. Oil can be stored outdoors above ground or underground—in garages, basements, or utility rooms. Many of today’s tanks are even guaranteed against leaking. Tank enclosures can be custom-built to complement the style of home.